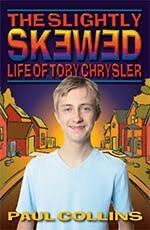 The Slightly Skewed Life of Toby Chrysler was written by Paul Collins, and published by Celapene Press, 2009. I interviewed Paul, who has had two Notable Books in the Children's Book Council of Australia Awards, on The Book Chook recently. I was intrigued by what he had to say about his latest novel, in particular the character who spoke in malapropisms. Toby's mum has been missing for more than a month. His new friend, Ginger, has lost her dad. So how can an abandoned red shoe, an unusual plan and map coordinates help them in their search for their parents? And why is everyone looking for Toby? I guess the book title should have hinted to me that Toby Chrysler doesn't have a normal life. After reading this novel, I am here to say "slightly skewed" doesn't begin to cover it. Toby, (or Milo to others, because he's not exactly Quik) lurches from one misadventure to another until we are left gasping and wondering if he will ever recover. Toby is one of those people who mean well, but somehow stuff just happens to him. Collins knows that kids want action and he gives it to them. Any young person who has ever wondered if he is slightly different, will relate to Toby who didn't mean to kill Mrs Appleby next door, and especially not twice. Collins produces quirky characters by the bin-full - some will make you laugh, some will make you cry, but all will grab your attention and refuse to let it go. This would make a great book to offer young teens. There is wry humour as well as slapstick humour, plenty of action, and yet the book is thought-provoking too. Why and how does our society discriminate against anyone who is "different"? Is telling the truth always the answer? Why would a mother leave her own child, anyway? And those malapropisms? Toby's friend Phuc mangles the English language with expressions like "the best laid plans of lice and men", and I think kids will enjoy them as much as I did. Is this author Australian? One of my favorite short story authors is an Aussie: Paul Jennings. I am discovering Aussie authors to be both hilarious and slightly odd! I have to check this one out. Thanks! I am pretty sure Paul was born in the UK, but we proudly claim him as an Aussie, so I hope he thinks of himself that way. I love the idea that Aussie authors are hilarious and slightly odd! I am now off to check out all my writing friends and see how that idea holds up. Hah! We have a friend nicknamed 'Muddy', short for mudguard. Why mudguard? Because he's not bright enough to be a headlight!! Oh, I do love the Australian "language". Colourful, politically incorrect, FUNNY! This author seems to be becoming quite popular here in the Uk. I've heard him described as the new Jacqueline Wilson, from your review something I'd have to question. It sounds like a great book, Susan. Why do I have the feeling that I won't be able to find it here in the US? You'd think in this day and age that people would have easier access to books published around the globe. Petty Witter, I actually hadn't heard of Jacqueline Wilson, but I've reserved one at the library. I can't comment on any similarity. Dawn, you can certainly link to buy the book from the publisher's site, but I know postage makes that expensive. After reading your review, I know just the students to recommend this book to, I have a feeling they are going to love it!